We are all aware of the violence in Ciudad Juarez and how it has escalated over the past years since the rise of the maquiladoras and the establishment of the North American Free Trade Agreement (NAFTA) in 1994. As violence towards women in general has increased dramatically, these femicides have attracted both national and international attention. In response to the increasing violence in the city the military and federal police’s presence has almost doubled, but the crimes continue. We’ve also learned that knowledge does not prevent crimes; corruption in the juducial system is like white noise to the vision of justice. 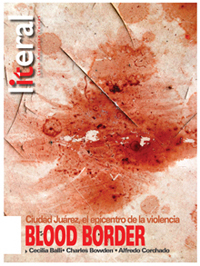 What we offer in the present issue is an analysis of how the presence of the army and the federal police has altered the challenging realities of Mexico and what the repercussions will be for the United States. Three prominent journalists address different aspects of border violence: Cecilia Belli, Charles Bowen and Alfredo Corchado. In addition, we offer a reflection on how the social media has damaged deep thought and a conversation with Jay Kennedy, who recently unveiled Plato’s code. Presentamos además un texto de Richard Watson sobre la incidencia de las nuevas tecnologías en la vida cotidiana y en nuestras formas de pensamiento. Asimismo, Jay Kennedy nos habla de la recóndita estrucura musical de los diálogos platónicos.